I’m at an orchestra festival today where one of my violin students was accepted. 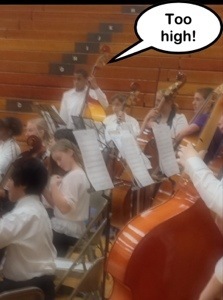 Of course, as a bassist, I immediately gravitated toward the bass section. I was horrified!!! The position, technique, and bow holds – OH MY! 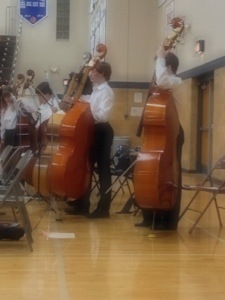 Out of 11 bassists, at least half of them had their basses TOO HIGH! Endpins were out so far that the neck heel was jammed into armpits and half position was in another part of the atmosphere. WHY WHY WHY? I don’t know. Perhaps they just really want to use their endpin. 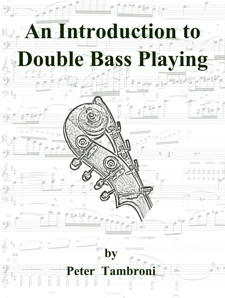 -If you’re shoulder and arm half to reach into an unnatural position for first position where much of bass playing occurs, the bass is too high. Where should the bass be? -Try aligning the nut / string saddle with the student’s eyebrow. But…but…If my bass is higher then I can reach thumb position easier… Right? -Wrong!!! The heel of the neck will hit your arm / armpit and IMPEDE you ability to reach those stratospheric notes. Try it! Lower your bass and go for those notes. Your arm will be FREE to play, shift, and perform vibrato. But…wait, what about my bow? Shouldn’t it be close to the bridge? YES! Rarely does bass height truly affect bow performance. Most students, MOST, CAN reach their bow lower than they think. Bass students tend to PULL their arm up, bending their elbow, hunching their shoulder….Which causes the bow to pull up AND be at an angle rather than perpendicular. Try this…Set your bass height as described above. Place your bow about 2/3rds of the way to the bridge. We’re going to play a down bow…. BUT FIRST…. Look at the button screw of the bow – I want you to imagine that as you pull the down bow you’re going to tap a nice dog on it’s nose. Your bow will inevitably go down and closer to the bridge and make a better sound. In contrast to that chicken wing arm bow stroke you had before. Oh, and put your endpin IN when carrying your bass. It’s way too easy for an extended endpin to catch something and injure both the player and instrument. Rock on and keep practicin’!